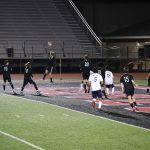 Friday night the Varsity Leopards soccer team hosted the Wildcats from Sulphur Springs in their last non-district match up the 2019 season. The Leopards matched up with the Wildcats in the 2018 playoffs, coming away with a 2-1 win to advance. This year the game was very similar, with both teams playing with high energy and great spirit. The first half saw no goals conceded by either team, although both sides had chances. Early in the second half, Sulphur Springs was able to draw first blood, beating keeper Sammy Merrick to his left. Down 1-0 the Leopards stormed back, possessing the ball for much of the remaining half. After spending 10 minutes in Sulphur Springs half of the field, Benji Merrick was able to connect with Caleb Toomey inside the 18 yard box, and Toomey buried the ball passed the Wildcat’s keeper. Unfortunately, even with being able to control the ball the rest of the half, the Leopards could not find the winner, tying 1-1. The boys will be back in action this Friday at 7:15 pm at Leopard Stadium, for their first district game of the season. They will take on Wylie East.